1. (+) Cassia, the Protagonist - Cassia is so much stronger and wiser in Crossed than in Matched. You can really tell the difference and see how much her character has developed so far in the trilogy. There are several times when she wants to give up, but she doesn't, and what I found even better was that she knew her mind. Though there still is that sort of love triangle, Crossed is very much a Ky book and the book where Cassia seems to choose the type of life she wants to have and is willing to fight for that until the end. 2. (+) Alternating Points of View - Crossed didn't have much for it in terms of actual plot-- I can think of Matched and a few specific things that happened in it to advance the plot, but Crossed is much more of a character book, and it shows in the alternating points of view. A lot of the most interesting things you learn about from Ky's perspective and he too sets the stage for suspicion about the Rising and what the third book will entail. I loved reading about how he saw the world and what had happened to him--his journey, in many ways, was much more fascinating than Cassia's and his character development more thorough. Fantastic decision on Ally Condie's part to give us both POVs. 3. (+) The Poetry - Ally Condie's writing is also a lot like poetry, but what I really, really enjoyed about this book was again the incorporation of other poems into the book. The poems from Matched become really important explanations for how Ky viewed Cassia and how the new characters view the two of them... and for the rebellion against the Society. I just love how Ally Condie makes every word count--that these poems, which had only seemed like words whispered between lovers in the first book, became so much more meaningful. 4. (+) The World-building - Okay, first off, I love Ally Condie's capitalization - the Rising, the Carving, the Warming, the Outer Provinces... I love that she doesn't explain some of these things like the Warming, that her capitalization basically tells you all you need to know about it. Secondly, I was fascinated by the history of the Society and the story of the farmers and the Rising and the way Ky's parents factored in and the Archivists and the blue tablets and the Enemy vs. the Rising and ah! All of it. So many more details were added to the world already established in Matched and I can't wait to see how the third book will bring them all together. 5. (+) The Romance - You guys know that I am not a fan of love triangles... but as I already said, this book feels very much like only a Ky book, so I'm disregarding the triangle and saying that wow, the love and romance is done so beautifully. So, so sweet and agh, there really are no words to describe Ally Condie's writing and how wonderfully this was done. 6. (+) New Side Characters - Four side characters are introduced who all have different stories to tell and who all are very interesting and integral to the plot. I cannot wait to find out more about them and see the rest of their character arcs unfold. 8. (+) The Setting - Ally Condie, on her website, has written about how Utah (I think) influenced the setting for Crossed, and I must say that I don't care what influenced it, only that I want to go wherever that is. Even though the setting is treacherous and hard to survive in, it is beautiful, and as is typical of Ally Condie's writing, it seems to have a life of its own. 9. (+/-) The Pacing - You can expect the same pacing that you get in Matched and the sense that things are slowly building to their end... but for someone like me, sometimes it does seem a tad too slow, even if I had expected it to be that way. 10. (+) The Cover - You learn what the blue tablets do... and though I thought that this cover was beautiful and symbolic when I first saw it, I now think it's even better and more representative of the book. 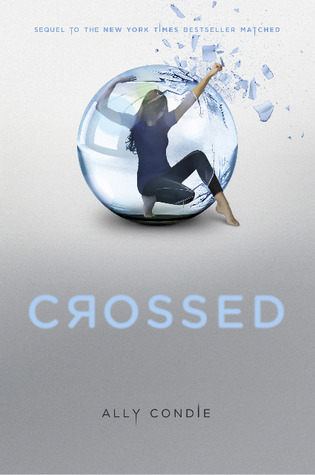 I loved Crossed just as much as I had loved Matched. Whatever Ally Condie writes, I will buy because one thing's for certain: she knows how to write and tell a beautiful story. I saw a copy while I was in Hastings today, but opted out for a John Green book. It sounds very intriguing and intertwined to me. Just the kind of book. Though I do not regret my decision.